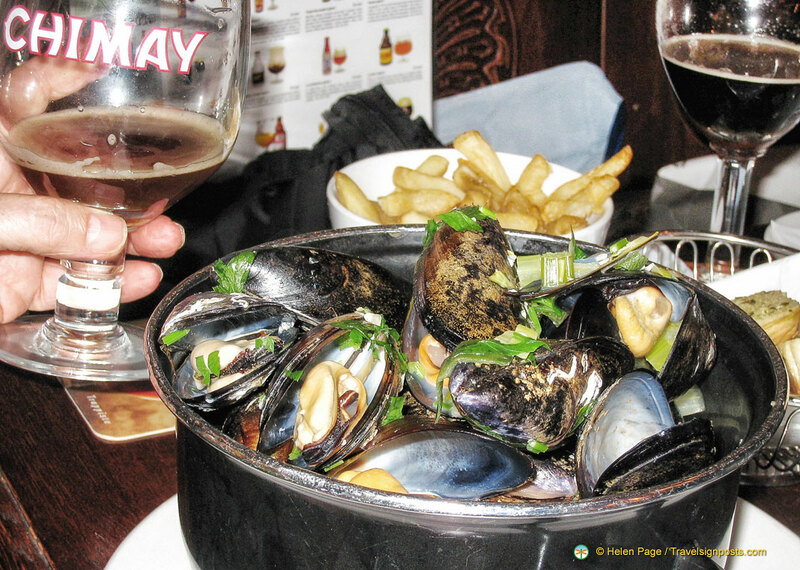 A delicious pot of moules et frites goes well with Belgian beer! That Moules et Frites is the national dish of Belgium is enough to get me to this country. Anyone who likes mussels and who has tried these large steaming pots of mussels in savory broth, accompanied by a bowl of Belgian frites and homemade mayonnaise, will understand why this dish is so popular. (Note that it’s Belgian fries and not French fries!) Then of course there is the range of Belgian beers that go with it. Moule Marinere is the most common method of cooking mussels. This is also the best way as it’s cooked with white wine, shallots, parsley and a little butter, keeping the flavours of the mussel clean. Some people prefer to have it cooked in cream or grilled with cheese, ah well – chacun a son goût! There’s something very special about this small nation of 10 million people that makes it world capital of Europe for beer, chocolates and many other things. During the 1958 World Expo in Brussels, Belgium became the true capital of Moules et Frites or mussels and chips, with the Chez Léon, the House of Léon being king of this gastronomic offering. Chez Léon has been a family business since 1893 when Léon Vanlancker first opened Friture Léon. Domestic success spurred the family onto international expansion and in July 1989 they opened the first Léon restaurant in Paris, on the Place de la République. More than 40 restaurants were opened in France over a 15-year period culminating with the opening in 1992 of Léon de Bruxelles on the Champs Elysées. It was at this Champs Elysées restaurant that I first discovered Moules et Frites and this is now one of my favourite foods. I didn’t know at that time that Chez Léon is a household name nor that moules et frites is Belgian’s national dish. If you’re in Brussels, be sure to visit Chez Léon, a genuine Belgian brasserie serving a whole range of typically Belgian dishes. Just to give you an idea of how popular the restaurant is, they serve half a ton of mussels a day just from their restaurant on the Rue de Bouchers alone. Not only do they offer 14 different mussel specialities, but they also have 120 other traditional Belgian dishes, e.g. rabbit stewed in kriek (cherry) beer and stoemp (bubble and squeak). Chez Léon also brew their own Léon beer.